In today’s highly complex global business environment, companies are constantly expected to do more with less—to run leaner while becoming more efficient and effective than ever. This is especially true for the accounting and finance areas. They’re now required to not only deliver periodic financial data and reports but also real-time analysis and intelligence. 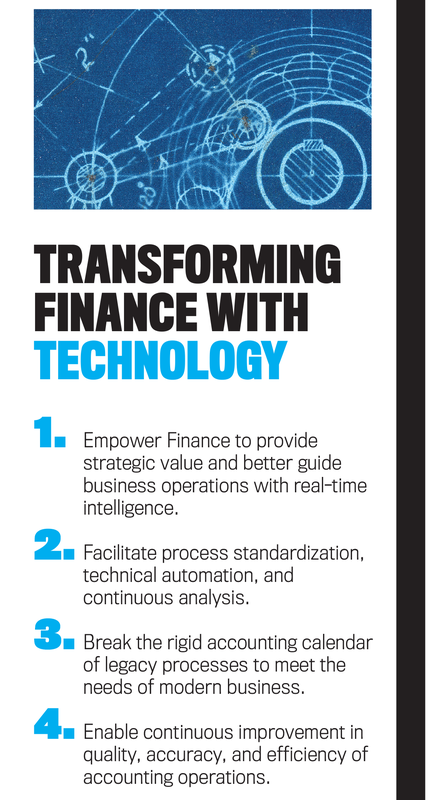 To meet these mounting demands, finance is shifting from traditional, rigid, and manual accounting processes to more automated, more flexible, and more agile operations. This shift is essential because it provides the productivity benefits that free organizations to deepen their focus on analyzing and reporting financial performance. Failing to transform core accounting business processes leaves companies at a competitive disadvantage. In order to make the shift from overworked cost center to strategic partner for their business, accounting and finance teams must step out from behind the spreadsheets and embrace the future. Technology is changing the way business is done all around us, and it’s time for accounting and finance to realize the evolutionary—and revolutionary—benefits of innovation. But technology is only part of the solution. True organizational transformation requires a fundamental shift in philosophy, one that combines technology with a focus on reimagining legacy processes, empowering the best employees, and embracing a culture of continuous improvement. There’s a significant obstacle facing accounting and finance teams these days: Traditional financial close processes weren’t built for the modern business economy. Manual processes are laborious and error prone, especially during the financial close. Each month this results in gratuitous resource demands, which include long hours that put incredible amounts of strain on employees, piles of binders filled with printed documentation, and mountains of spreadsheets to sort through whenever there’s an exception to investigate. The conventional record-to-report (R2R) model condenses a huge amount of work into a short time span and delays data processing and reporting to the end of the period. This is a reactive and expensive approach. Moreover, it leaves no time for analysis, and the increased risk of error can damage the quality, accuracy, and timeliness of results. Trying to cram this much work into just a week or so can make accounting and finance teams bleary eyed from the tedious tasks and hours of overtime, with the result often being out-of-date or inaccurate results. The process isn’t broken—it simply has failed to modernize. The “always on” nature of business today involves globally dispersed transactions that come in around the clock, vastly increasing the number of unreconciled transactions. 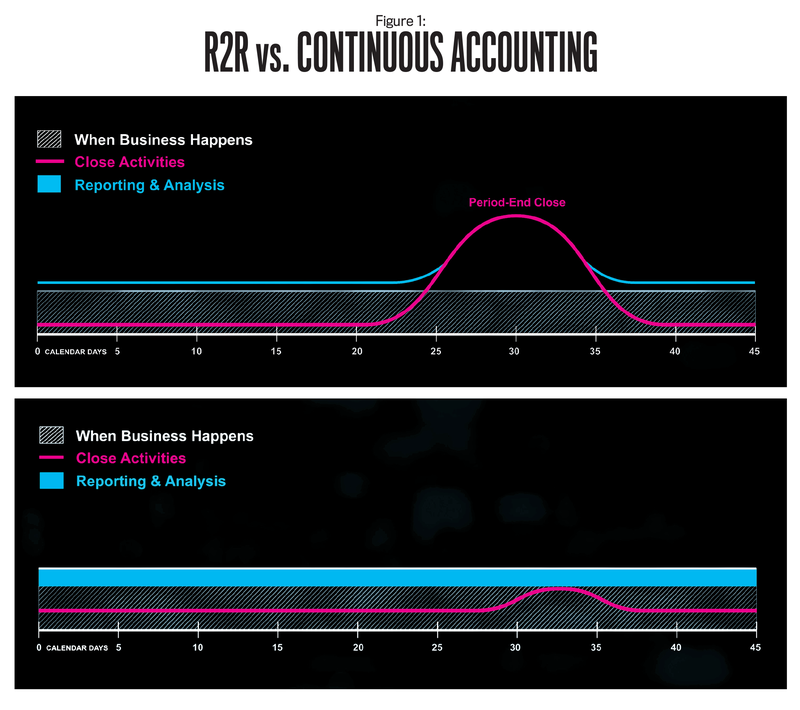 Also, Continuous Accounting more evenly distributes the workload associated with the period-end close while enabling constant reporting, verification, and analysis. 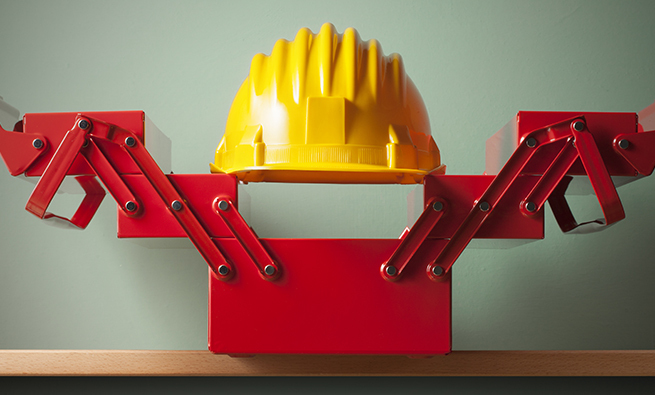 The ability to perform tasks in smaller chunks on a more frequent basis evens out workloads. Being able to evaluate the integrity of information at any point in time facilitates continual monitoring for errors, fraud, and inefficiencies. Anytime access to the data allows teams to look at the impact of changes such as currency fluctuations with up-to-date financial intelligence. This concept represents a fundamental shift in the way that accounting and finance are done. When automatic processing eliminates rote tasks, accuracy is inherent. Continuous Accounting empowers accounting and finance teams with real-time intelligence, enabling skilled accountants to spend more time on strategic research and analysis and become proactive business leaders instead of reactive operators. Before you think “Oh, not another technology story!” consider this: Continuous Accounting isn’t just another way to do account reconciliations or an impractical pipe dream attainable only by the largest companies or the smallest, most agile teams. This modern, philosophical shift is an ongoing, stepwise journey with achievable milestones. 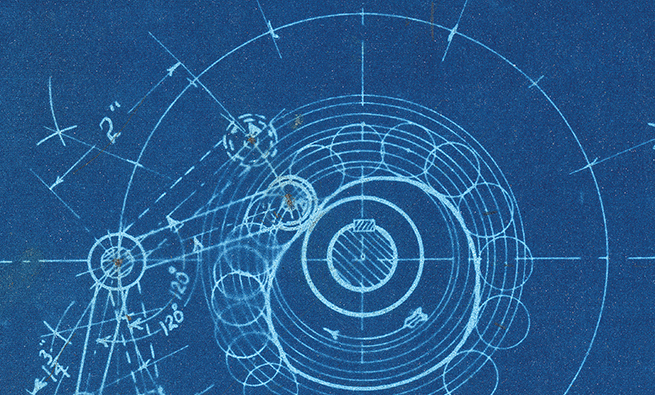 It’s about timing, process design, and unleashing the power of exceptional accountants—a blueprint for the modern, strategic accounting organization. Implementing Continuous Accounting effectively requires a holistic approach, combining a mix of technology, processes, and people to realize continued improvements across the accounting organization. Using technology to automate procedures enhances the benefits of process optimization while increasing the overall productivity of accounting team members. Optimized processes reduce risk, improve accuracy, and increase efficiency, benefiting the entire accounting and finance functions. Reducing manual and rote workloads frees team members to be more productive and use their exceptional abilities to drive value for the entire business. Finally, the whole organization uses these gains to provide continued strategic value to the broader business. Here are the interlocking, interdependent pieces that together make Continuous Accounting a successful approach for an organization of any size. Following that logic, however, can lead to clever workarounds that masquerade as “automation” within existing systems, even including spreadsheets. But by investigating the technology landscape while reviewing a process, if not before, organizational leaders can open their eyes to previously unimagined possibilities. Left unchecked, manual processes, together with expanding data volumes, prevent finance from making the shift from back-office accountant to strategic business partner. Rote, human-driven, and error-prone manual procedures expose companies to the undue risk of inaccuracy or, worse, restatement. The essential first step to process improvement is to identify the bottlenecks, which typically stem from highly labor-intensive, manual procedures. This is where you’ll find the greatest opportunities to improve and streamline existing processes. Taking a gradual approach to modern process improvement is essential because it allows your organization to realize incremental results and benefits with every step and at every level. This is where talented professionals like you come in. While there appears to be widespread agreement that accounting and finance have the necessary skill sets to drive business strategy, these skills are generally underutilized. To unlock this value and allow your talents as management accountants to shine, companies need to automate the manual accounting work that consumes so much of your time and effort. When manual processes are automated, accounting and finance teams spend fewer hours on transactional activities and get to shift their focus to analyzing the data and reports and addressing just the exceptions. Thus, by embedding Continuous Accounting practices, everyday accountants can become exceptional accountants, providing high-value, strategic services in areas like fraud detection, compliance, data analytics, technology, and business advice. 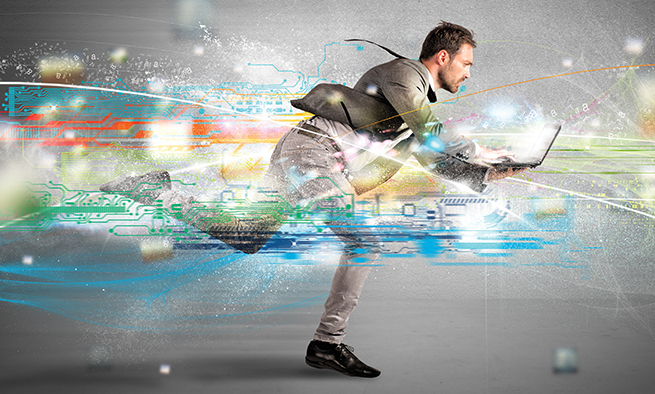 Modern business requires every part of the enterprise to be forward looking and strategic. Adopting technology, improving processes, and empowering people should have clear, tangible benefits to the organization. For instance, evaluating key performance indicators (KPIs) for timeliness, accuracy, efficiency, and employee satisfaction, among others, enables organizations to establish baselines and review results to facilitate continuous improvements over time. Additionally, these metrics allow finance leaders to see how their department is performing so they can manage their operations efficiently and enable data-driven decision making. Nevertheless, by applying the principles of Continuous Accounting, automating accounting processes, and improving legacy processes, strategic accountants are unleashed to analyze data, which gives senior finance leaders timely, accurate, and consumable information. In other words, Continuous Accounting delivers real-time intelligence and unlocks competitive advantages for finance and the entire organization its team members serve. Without question, getting started on putting a Continuous Accounting approach in place might be the hardest part. Many organizations fear finance transformation projects. Horror stories of failed attempts, as well as the confusion of figuring out exactly where to start, leave many quitting before they even begin. Yet Continuous Accounting isn’t an all-or-nothing proposition. It’s a stepwise journey. The best-performing finance teams embrace this journey and embark on it by building a culture of continuous improvement with technology, processes, and people for the benefit of the entire organization. They know that success means setting goals and always adapting, innovating, and improving in order to meet them. 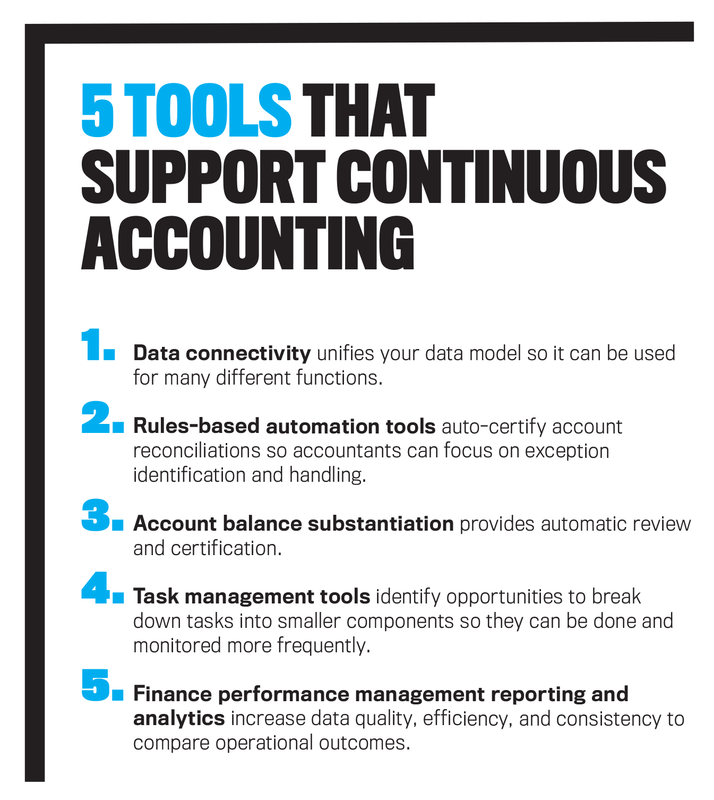 Here are five levels of the Continuous Accounting maturity model (see Figure 2). As you evaluate them, keep in mind your organization’s specific needs and goals. While technology has revolutionized the modern business world, the R2R process has remained unchanged since the days of Lotus Notes and 18-inch paper. Enterprise resource planning (ERP) systems and spreadsheets are still the only traditional tools available for today’s accounting and finance professionals. Though many people accept this as “the way it’s always been done,” it results in a time-consuming, inefficient process fraught with risk. Talented accountants are spending most of their time performing rote tasks that take them away from value-added activities such as the enhanced analysis and strategy that drew them to this profession in the first place. The Continuous Accounting model utilizes individualized tools and integration to automate the R2R process. An investment in purpose-built technology to automate and streamline existing processes must be led by a strong leader with a vision and mandate for change. Naturally, there’s often internal resistance to change that stems from a distrust of technology or a certain comfort level with current processes. An empowered change agent can sell technology as a tool that not only delivers speed and accuracy but transforms the way accounting and finance work as well. Cutting-edge, best-in-breed software provides extensive automation and support for complexity and volume. With this in place, the financial close is managed effectively, issues are identified and addressed as they crop up, and analysis can be performed throughout the month. The concerns that controllers previously had about overtime, incomplete work, errors, and not completing the close on time disappear, and frontline managers and senior accountants have broad autonomy to balance workloads and make decisions. The road to this point of the process is paved with questioning conventional wisdom, challenging organizational inertia, and rebuilding the R2R process with an emphasis on real-time processing. Because people are at the heart of innovation at every company, there’s undeniable value in developing exceptional accountants. This means empowering people to make decisions, expanding their strategic and analytical abilities, and maximizing their skill sets. When staff accountants are granted broad autonomy to regulate their own workload and to identify, remediate, and resolve issues, they’ll work collaboratively with limited oversight. With the right tools in place, the financial close becomes a nonevent with a combination of technology and process redesign. Accounting shifts its focus to driving value for the business by proactively identifying issues and partnering with other teams. All of this leads to an organization that’s truly data driven. Work is broken down into smaller and smaller chunks, more automation is brought into play, and reconciled and validated actuals are produced with virtually no added work. 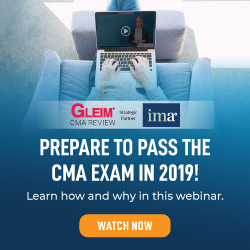 In this new environment, accounting and finance are constantly looking for new ways to use technology, while real-time data and metrics allow management to benchmark success, coach their professionals, and continually identify little ways to improve. These small changes add up and lead to a daily increase in efficiency and effectiveness, encouraging a companywide culture of continuous improvement. As mentioned earlier, the first step in any process is always the hardest one to take. 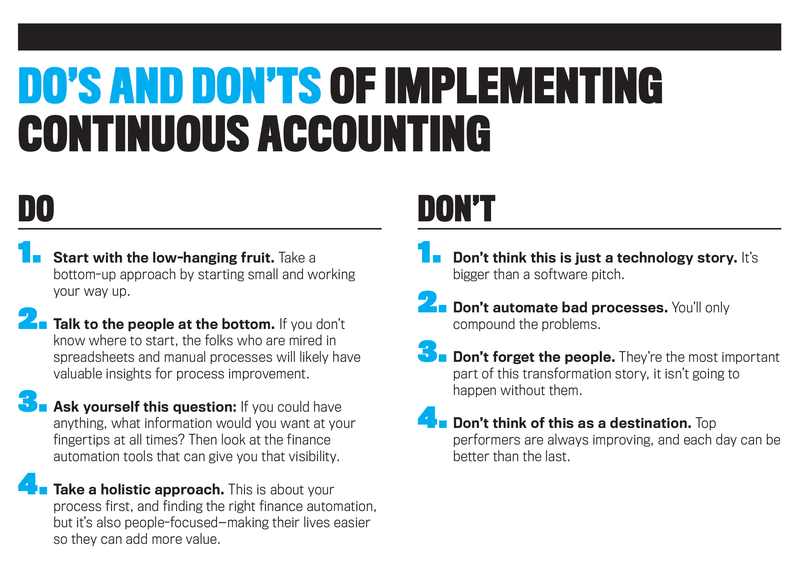 Implementing Continuous Accounting is certainly no exception. Here’s how to get started. Step 1: Analyze your current state. What are your greatest challenges? Consider visibility and efficiency gaps, determine your exposure to risk, and ask the members of your team to help you identify the most painful, inefficient, and risky accounting processes. Step 2: Design your future state. Imagine the ideal state of your organization by playing the “What If” game to design your plan for the future. Start with the low-hanging fruit and areas with excess risk exposure. Then identify critical areas for regular review and proactive investigation. Step 3: Automate and optimize processes. Split and batch processes into smaller components, then schedule those components more often and embed them within daily activities. After your processes have been improved and standardized, automate wherever possible. Step 4: Monitor metrics and results. Leverage continuous activity to constantly review output, and investigate alerts from flux analysis, exceptions, and anomalies. Make adjustments as needed in real time. Step 5: Review outcomes and controls. Either quarterly or annually, review the outcomes of your Continuous Accounting journey. Discover macro trends, and identify process and controls gaps. Compare the results against your original objectives: What worked and what didn’t? Step 6: Improve continuously. Combine the knowledge gleaned from the Review stage, then rinse and repeat! Return to step 1 and focus on a more challenging tier of improvements (i.e., the risky and critical gaps). The most successful process-evolution projects start at the bottom and work their way up. When you break down any process into its smallest components, opportunities for continued automation and optimization surface organically. 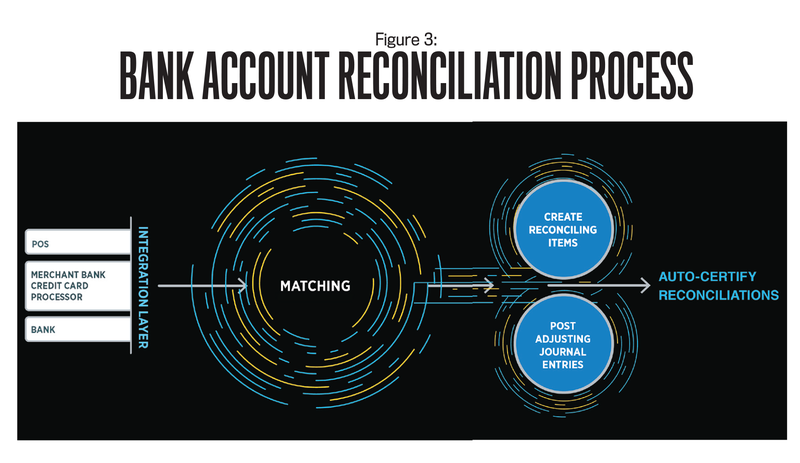 Take the process of reconciling a bank account (see Figure 3). 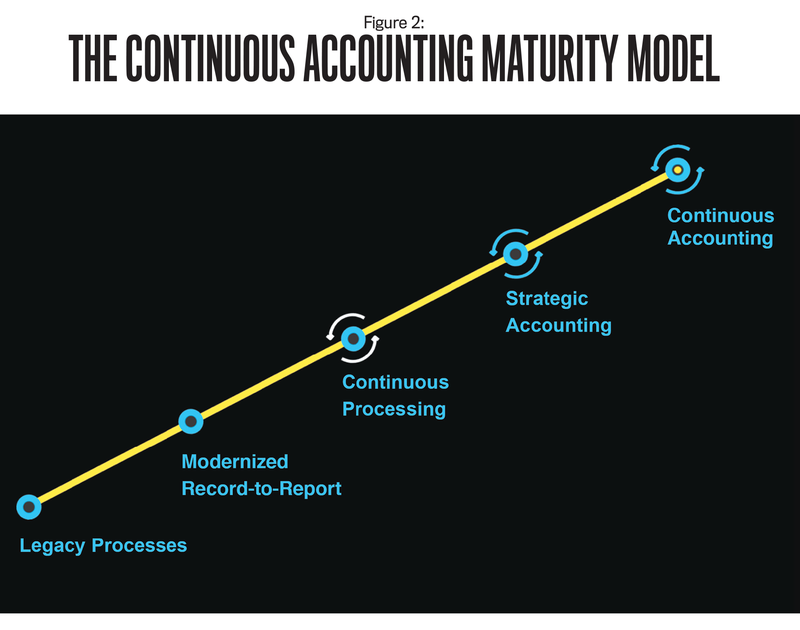 Organizations in the early stages of the Continuous Accounting maturity model probably manually tick and tie transactions to complete reconciliations on spreadsheets, print them, and store them in a binder somewhere. An obvious first step to improvement here would be to adopt software for account reconciliations. This helps streamline and control the process, but transactions are still manually matched and reconciled, and correcting journal entries are created separately in the ERP, then attached to support the reconciled balance. The next step to improving this business practice is to automate the processing of the detailed data behind the account balance. Thousands of transactions make up high-volume bank accounts, requiring manual ticking and tying—a process full of rainbow spreadsheets, macros, and confusion. Automating transaction matching not only removes much of the pain associated with reconciling high-volume accounts, but it makes exception handling and categorizing transactions as reconciling items easier. Once an organization begins modernizing its R2R process by centralizing account reconciliations and automating transactions, the practice of automating logic-based, complex journals creates a comprehensive end-to-end process. By leveraging journals-management software, companies can unify entry creation and posting across disparate ERPs and systems and ensure that correcting entries are always tied to the associated reconciliation. This embeds consistency and control into the creation of journals while ensuring instant visibility into all reconciling items. 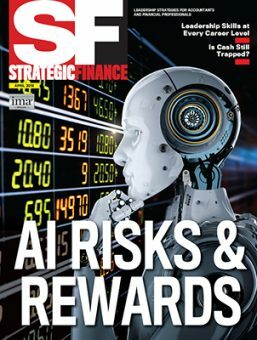 With transaction matching, automated journals, and account reconciliations, even historically resource-intensive processes like reconciling high-volume bank accounts can be run automatically and continuously, leaving only exception handling to the capable, nuanced intelligence of skilled accountants. As new technology is adopted, processes are improved, people are empowered, and the entire business realizes unprecedented agility that enables intelligent analysis and data-driven decision making. More than anything else, Continuous Accounting is a mind-set. It transforms the way accounting and finance work—independently and together—by emphasizing real-time processing, differently skilled employees, and deep analysis. 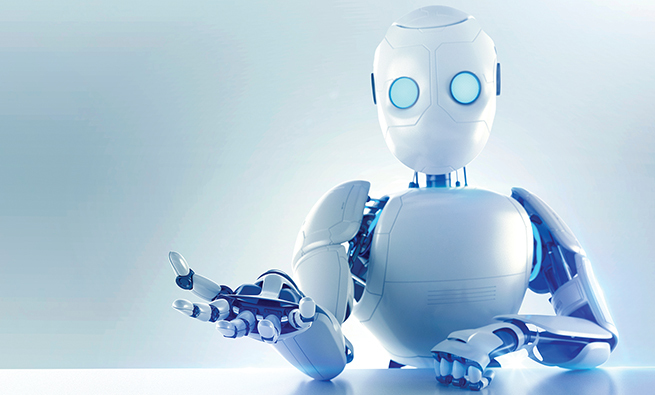 Top-performing companies with this mind-set are closing faster and, according to The Hackett Group, have 90% greater automation, 46% lower audit fees, and 52% lower costs overall. Continuous Accounting is an exciting and novel approach that delivers incredible benefits for accounting and finance. Instead of enduring reactive operations, organizations and teams work proactively. Instead of gross workload imbalances, work is distributed throughout the period, freeing time for in-depth analysis and more value-added projects. With unique visibility into the current state of a company’s finances, company leadership and the entire business realize unprecedented agility. 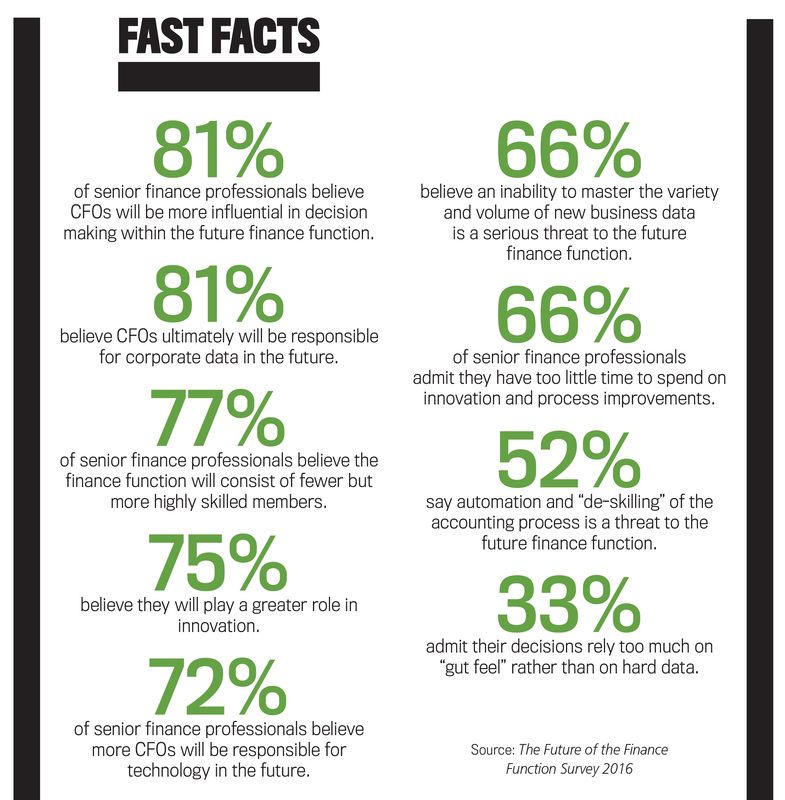 A world where the CFO can walk into any meeting and provide real-time, up-to-date, up-to-the-minute financial intelligence is achievable. Modernizing legacy R2R processes isn’t an option, and any company that avoids transforming its finance function is putting itself at risk. Beyond the risks associated with out-of-date accounting and finance practices, the increasingly complex nature of global business cycles means that companies that are slow to modernize their accounting operations will remain at a competitive disadvantage. People are valuable. We don’t waste their time. Technology is powerful. We use it to enable our people. Processes are malleable. They change to fit our objectives. Numbers matter. We use metrics to improve everything we do. Nothing is perfect. We’re continuously improving. The best-performing accounting and finance teams know that success means always adapting, innovating, and improving. This shouldn’t be discouraging—it should be inspiring. When it comes to your own organization, no matter what’s going on right now, every day can be better than the last! 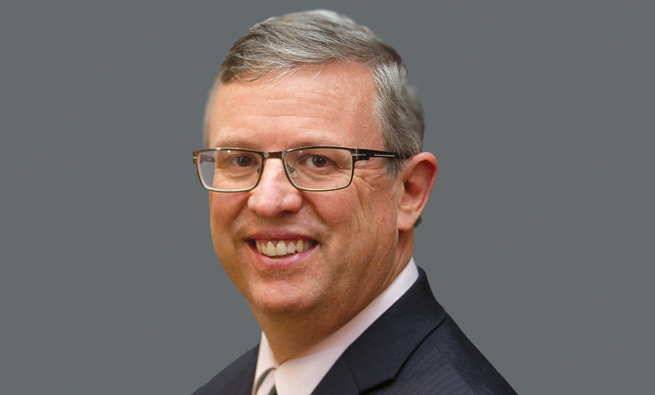 Isaac Tucker leads the Product Management division of BlackLine, a provider of financial controls and automation software, where he guides product development strategy. You can reach him at isaac.tucker@blackline.com. Great article. Biggest problem is the downward directed finance and accounting software systems that lack flexibility and are financially punitive to even attempt to change. I Really believe in your focus on people and looking for changes from the bottom up. big advantage to the mom and pops who do their own programs.